If you use the Internet every day, as many millions of people do, you are living in something of a bubble. For instance, when you spend your life online it is all too easy to think “everyone” does their shopping online. Yet, in fact, over 95% of all goods we buy are bought from bricks and mortar stores. In spite of its success, online shopping is still only a small proportion of retail. And when we are facing inboxes full of email messages and window after window of information to absorb, it is quite believable that digital is the way people prefer to get content. Except outside the Internet, print is alive and well. Indeed, sales of printing paper have never been so great. In spite of being surrounded by digital technology, real world activity is still immensely high. Whether it is shopping or reading – the Internet is not the only place people do it…! The human brain loves to categorise things. Indeed, categorisation is a fundamental part of how we recognise things, how we remember what they are and how to use them. In the past we only had two categories of communication – printed and face-to-face. Now we can have emails, instant messages, Tweets or posts on Facebook. The more communications technologies we have, the more our brains like it because it helps categorisation. So, people have emails for work, instant messaging for family, Facebook for friends and so on. The more technologies we use, the better it is for categorisation. Now, it seems people are categorising information according to different purposes. 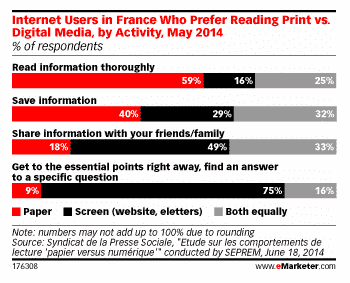 New research in France shows that people are preferring digital communication for one thing and real printed information for something else. People are no longer making a choice between print or digital, but making the decision according to the purpose for which they need the information. Because we now have different methods of providing information, people are creating mental categories as to what each kind of information is for. The study shows that people are using digital for information they want to share or to check a quick fact. But for in-depth information or material they want to have for future reference, print is the preferred technology. What this study shows is that you need different delivery for various types of information. For instance, if someone wants to share information you need the material available digitally. But if your audience wants to store the information you need it available in print. Of course, you cannot always achieve that easily online. But what you can do is to make some information available on a web page and then the in-depth material to be stored available in PDF format which can then be downloaded and printed ready to store.